Brexit crisis: in the aftermath of the UK's decision to leave the European Union, illustrators have been quick to post their reactions on Instagram and Twitter. The UK woke up to find out that the country had voted in favour of leaving the European Union in yesterday's referendum. The leave campaign received 52 per cent of the vote, while 48 per cent voted to remain. The creative community – the majority of which was vocal in its support to remain in the EU ahead of the referendum – has responded to the news with a host of graphics and illustrations. Many of the images show one of the 12 yellow stars of the European Flag fallen out of the circular arrangement, or replaced with a teardrop. One illustration depicts a man on a ladder covering over a star with blue paint – the colour that forms the background of the flag, which was first designed by Paul M G Lévy in 1955. 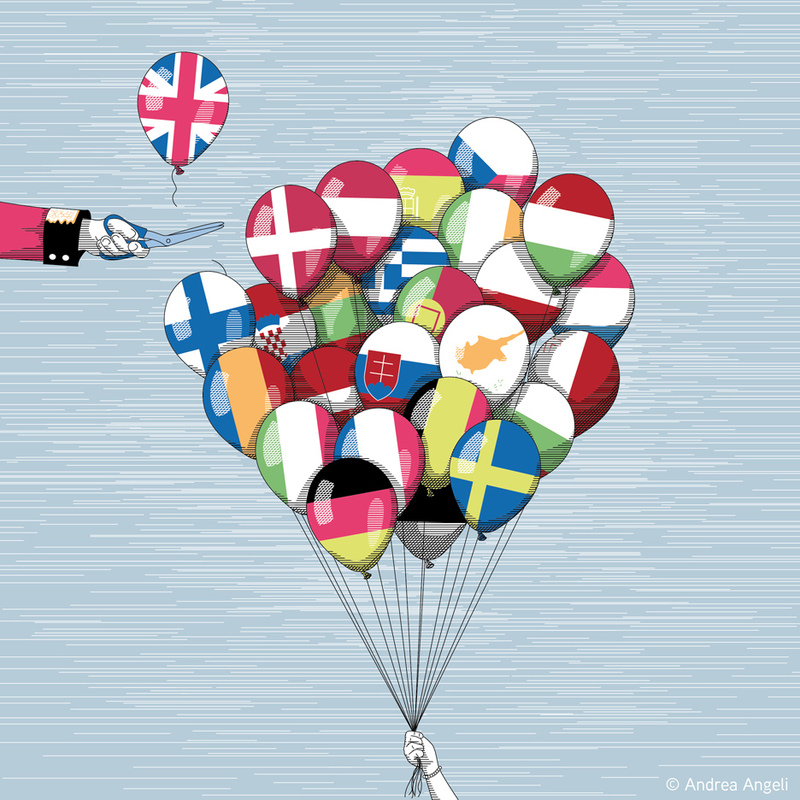 In a picture of a bunch of balloons by Andrea Angeli, each displaying the EU member countries' flags, the UK's string has been snipped. On a similar theme, a graphic that originated in the Wall Street Journal shows a map of Europe stitched together, but the threads connecting the British Isles to the continent are being cut by a giant pair of scissors. A variety of stock images have also begun to circulate on Instagram. In the run up to yesterday's vote, a selection of the UK's leading architects and designers told Dezeen that they all backed a decision to remain in the EU. Dutch architect Rem Koolhaas and British designer Tom Dixon were among those who spoke out about their opposition to Brexit, while a survey found that 90 per cent of British fashion designers were in favour of staying. Early on in the campaigns, German photographer Wolfgang Tillmans created a series of graphics that urged voters to back the remain camp.